CoderDojo is a world-wide, volunteer-led, free coding club for kids. Just three years ago, CoderDojo began in Cork, Ireland with only a few kids and volunteers. Since the CoderDojo movement began, it has grown and evolved in over 50 countries. How did CoderDojo Muscatine begin? ﻿In September 2014, CoderDojo ﻿Muscatine was established by Caitlin Johnson in an effort to emphasize the importance of science, technology, engineering, and mathematics (STEM) to young people. 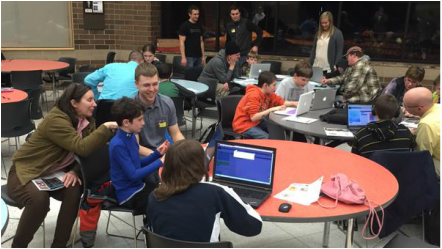 With the help of several other HNI members including Maxx Williams, Katie Williams, Sean Pietri, Stephanie Davison, Melissa Biestek, Shawn Henning, Michael Sesker, Andrew Cain, Oisin Wyley, Joe Gassman, and TJ Nanke, CoderDojo Muscatine was established. Who attends CoderDojo Muscatine events? CoderDojo is open to kids age 7-17. We do ask that a parent stay for each event to serve as an advocate as their kids begin to learn the magic of coding. By giving kids access to the magic behind technology, we are introducing them to the importance of computer science and engineering. By offering a high-energy, collaborative coding community, each new coder builds complementary analytical, innovative, and creative skills. What is the job of the volunteer?